It was an exceptional performance today from Chatham Town at The Bauvill Stadium as they put nine goals past a very poor K Sports side. It didn’t take long for Chatham to get into the game as they got their first goal on the very first minute. It was none other than captain Paul Vines who got the goal as the ball come in from a good corner on the left-hand side with all the K Sports defenders being drawn towards the ball, leaving Vines unmarked to get his head on it and convert it. Chatham looked very ready for this game as on the 7th minute they had another chance coming from Vines who had yet another free header, but this time is just whistled past. But this miss didn’t get to Vines as he got his 2nd of the day in spectacular fashion on the 12th minute. A lovely floated pass found Vines in space who hit it on the volley right into the corner of the net. 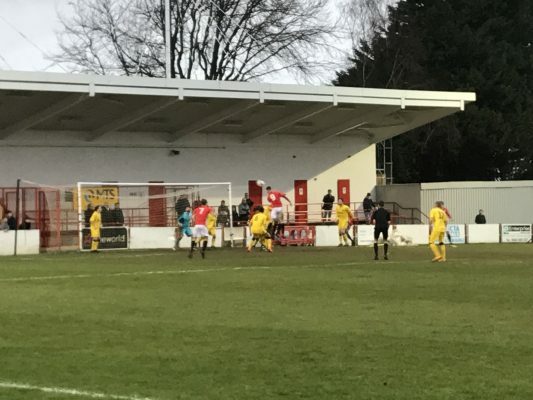 The Chats were not finished there as they continued to push for more as on the 17th minute they had another chance, this time coming from Jack Evans. Evans pushed his way through the midfield and easily brushed past the defense with a lovely bit of skill, but he couldn’t get the finishing touch as his weak shot rolled straight into Adam Highstead’s hands. It wasn’t long before Highstead was beaten again as on the 20th minute, Chatham had their third. A lovely ball in across the goal fell to Byron Walker who slid in to poke it home. Chatham continued their attacking play as on the 24th minute they could’ve possibly had their fourth. The ball came in from the corner and fell straight to Walker whose header hit the post and then fell to Evans who sent the defender the wrong way and then took his shot but yet again it rolled straight into the keeper’s hands. But it didn’t take long for Walker to correct his mistake of hitting the post as on the 26th minute, he got his 2nd of the game. A lovely run by Jon Pilbeam was finished off by a lovely cross in to the box which fell straight to Walker who smashed the ball into the top of the net to make it 4-0. Chatham weren’t done there either as Pilbeam continued the attacking play on the 30th minute as he ran down the wing and then floated a perfect cross into the box to set up Walker for his hat-trick, but Walker just couldn’t get a touch. Pilbeam wasn’t just going for the assists this match as on the 36th minute, he scored an absolute beauty. Pilbeam found himself on the edge of the box and went for the finesse shot which flew through the air and nestled itself right into the top right corner, making it 5 for The Chats. All the Chatham players wanted in on the goals, but Walker had the best chance out of all of them whilst looking for his 3rd. The ball come in from the right of the pitch and fell to Walker who showed a spectacular bit of skill to spin past the center back to then volley the ball, but it was straight at Highstead in goal. The second half got underway and just like the first, it looked like Chatham was going to dominate it as they had a very quick chance. Matt Bodkin put the ball into the box which was looking for Vines who was on for the hat-trick, but it just floated out on the 49th minute. But on the 56th minute, K Sports finally had a chance of their own when Jason Perry’s free kick found a K Sports head, but Dan Ellis pulled off a sensational save and pushed the ball out for a corner. 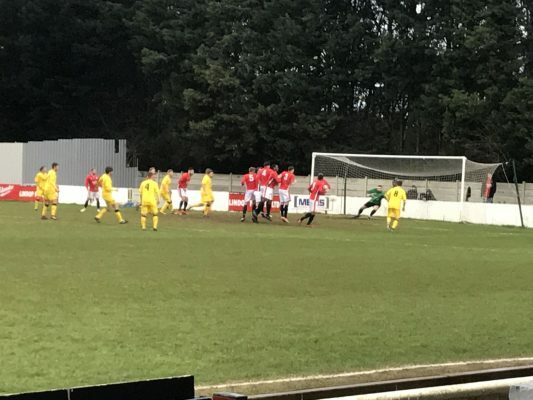 Chatham replied and rubbed salt into the wounds of K Sports on the 67th minute when substitute Michael Hagan made it 6 after meeting a cross and then putting the ball under the keeper into the back of the net. Just 2 minutes later, on the 69th minute, Vines got his hat-trick. Vines firstly had the chance to get his hat-trick from a penalty on the same minute but Highstead guessed the right way and saved Vines’ shot but Vines was there to snap up the rebound. Vines wasn’t stopping there as he got the 8th of the game and his 4th on the 76th minute. A lovely corner was thundered into the box and Vines was the one who rose the highest to head the ball into the back of the net. Chatham just kept going as they had another one within 5 minutes! Hagan had grabbed his second of the game after going 1 on 1 with the keeper and then as cool as you like, passed it into the right corner to make it 9! Then with just 2 minutes left of the normal 90, Hagan almost had his hat-trick and almost made it 10 when he got 1 on 1 yet again with the keeper but this time Highstead got the better of Hagan and tipped the ball away for a corner. Jack Hill then blew his whistle and ended K Sports’ misery and gave Chatham the three points they very well deserved. Chatham fans will hope that these kind of results keep coming and hope they can do the same to Beckenham Town next Saturday. Chatham Town: Dan Ellis, James Fray, Matt Parsons, Reece Butler, Richard Avery, Corey Walters-Wright, Jon Pilbeam, Jack Evans, Paul Vines (C), Byron Walker, Matt Bodkin. Subs: Michael Hagan for Byron Walker (57th Minute), James Fray for Sam Welch (69th Minute) and Brett Ince for Jack Evans (75th Minute). Subs Not Used: Ben Wilson and Tom Fitzgerald. K Sports: Adam Highstead, Harrison Hatfull, Joshua Gilbert, Jason Perry, George Snelling (Captain), Connor Morgan, Regan Corke, Jack West, Matt Gething, Alex Arif, Sam Stace. Subs: Reece Gillies for Regan Corke (69th Minute) and Caine Smith for Sam Stace (69th Minute). Subs Not Used: James Jeffery, Ashley Cooper, Tom Skelton. Yellow Cards: Jason Perry (33rd Minute), George Snelling (63rd Minute) and Adam Highstead (81st Minute). Assistants: Keith Wenham and Piotr Zachwieja. 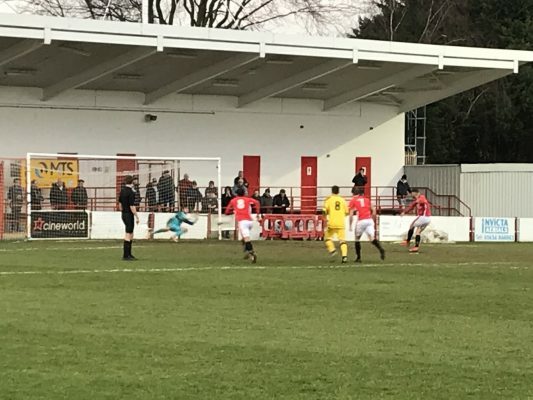 This entry was posted	on Saturday, January 26th, 2019 at 4:58 pm	and is filed under Featured, Football, Non-League Football. You can follow any responses to this entry through the RSS 2.0 feed. Both comments and pings are currently closed.